Somehow i felt like blogging is taking a back seat, professional life is quite hectic now. With just three months to end an Academic year, so many things are happening in my profession. Nothing to do with, late month i couldnt able to participate in an event which is quite close to my heart. Yes am talking about the Shhh Cooking Secretly, a monthly event started by me, which is now hosted by Mayuri Patel. Last month's theme was Goan cuisine which is one among my favourite. Obviously i was looking for the annoucement of this month's theme and joined immediately as we are landing to Gujarat. 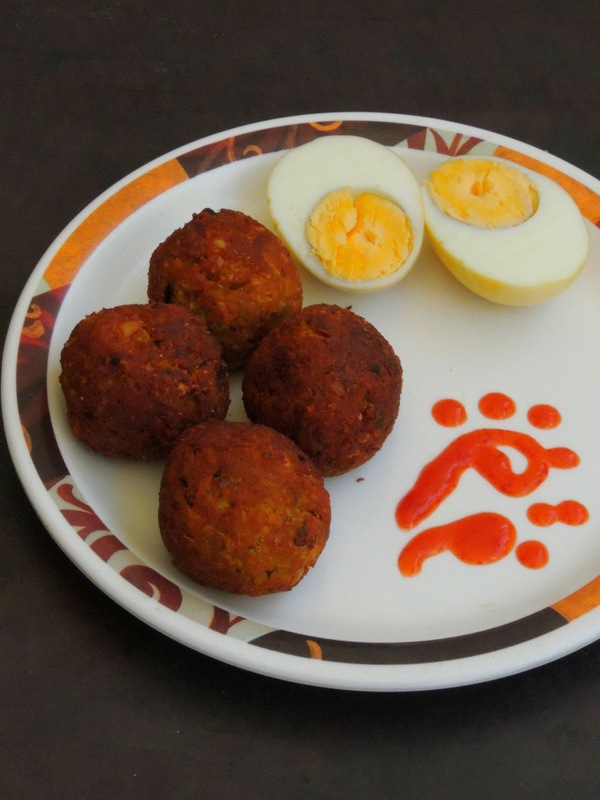 Gujarati cuisine is definitely an another Indian cuisine which is quite popular around the world. Their dhoklas and khandvis have their own place in most of the North Indian Thalis. Their way of cooking foods are seriously very simple with gluten friendly ingredients as much as vegan as well. Gujarati cuisine is one of the oldest cuisine with unique cooking style, different pickles, farsans and chutneys with are highly nutritional. Quinoa is one of my favourite grain after rolled oats. I have been preparing many delicious, healthy dishes out of this incredible grains since a long. And this grain is completely versatile, yes you can dish out many fabulous healthy snacks to sweets with this grains. 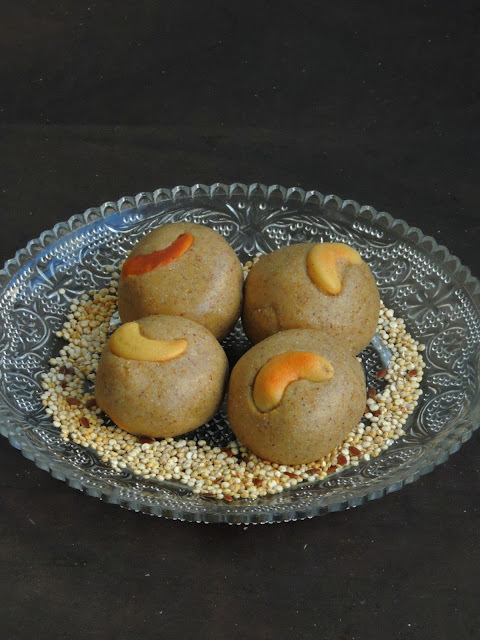 When i picked All that come round are laddoos as theme for this week's blogging marathon, i couldnt stop myself to dish out some delightful laddoos out of this tiny nutty grains. To make this ultimate laddoos more healthier, i couldnt stop myself to add some dry roasted flaxseeds to this simple laddoos. Both flaxseeds and quinoa works awesome together to prepare these cuties. My this week's posts are going to be some interesting round balls. Yes this week's blogging marathon theme is All that come round are laddoos. Obviously when i picked this theme for this week's blogging marathon i couldnt think more than dishing out some crispy balls. 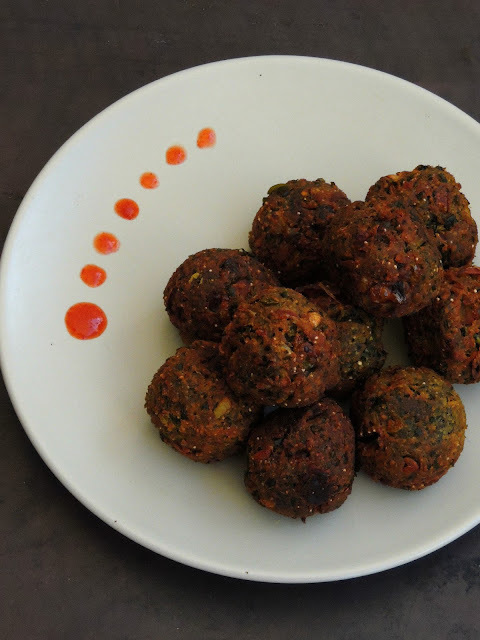 Chettinad cuisine shares many succulent dishes and one among those dishes is their popular kola urundai aka spicy deep fried crispy balls. 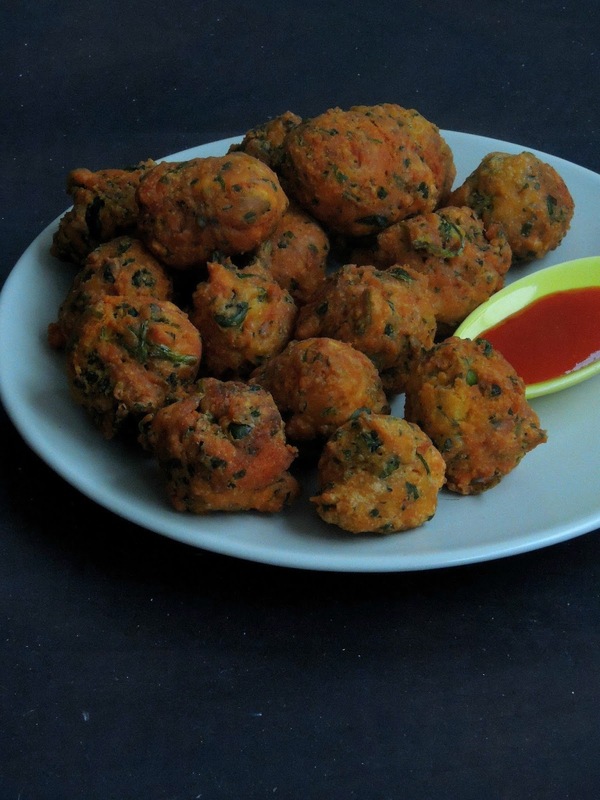 These balls are usually made with either elephant yam, raw banana, but i made some twist and dished out this dangerously addictive spicy balls with both mushrooms and spinach. Bread baking is one of my favourite passtime especially when i dont have nothing to do apart from mobbing and cleaning. Havent baked bread since a long as i had a small health issue, now am doing much better. Obviously i gathered everything to bake some bread at home during the weekend. Hubby and kids were asking me to bake something as a loaf for their weekend breakfast. And i picked this Havrebrod to bake for our weekend breakfast. You might have noticed that i love baking and cooking with oats, and this Danish oat loaf tempted me to bake. 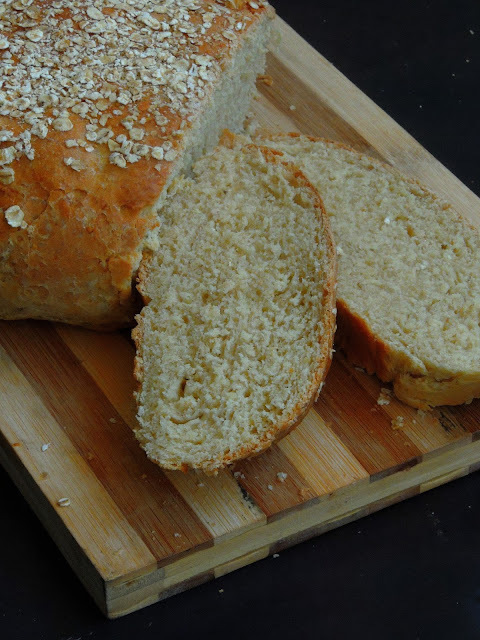 Very easy to bake, you doesnt need anything special to bake out this bread. If you love chocolate, this cake will definitely please you. And trust me if dont like coconut in your bakes, then this cake will definitely tickle your tastebuds. While i was looking for a different baked goodies from Norwegian cuisine, i was surprised to see this Ryttarkaka, aka sticky chocolate cake with coconut topping. Though i dont have great fans of cake or cookies baked with coconut at home, i was very much tempted to bake this cake. But one thing that pulled me to bake this cake is the chocolate brownie cake which is the most important base for this Ryttarkaka . Yes this cake calls for a brownie batter which is later topped with coconut topping. Obviously i gathered all the ingredients and baked this fabulous cake few days back at home. Scandinavian cuisine includes three countries, yes Norway, Denmark and Sweden. And these three countries shares similar cuisine style. The most important meal of Scandinavians is their breakfast as they start their work early in the morning. Though Scandinavian cuisine goes for easy cooking process, most of their dishes are quite popular around the world. 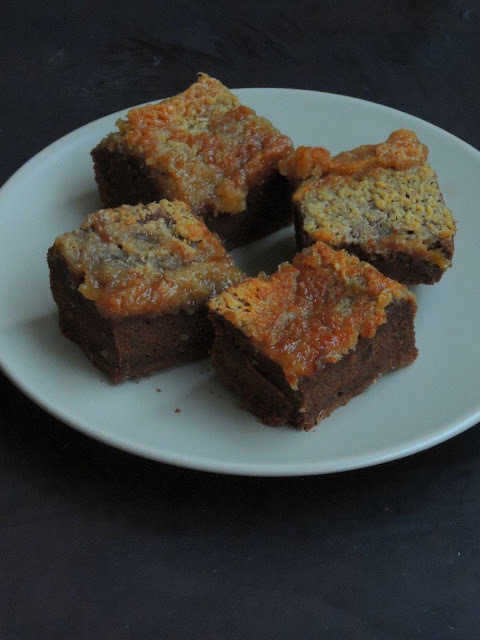 Am running this week's blogging marathon with 'Scandinavian Recipes' as theme. Obviously i picked three different dishes from two of those three countries, and my today's post is from Norway. 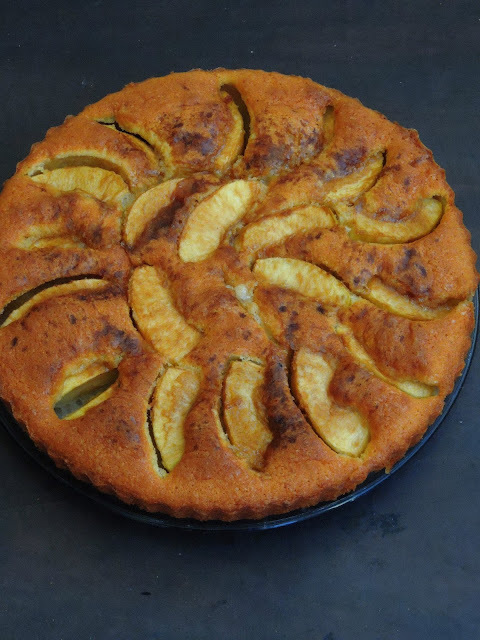 Eplekake is Norwegian Apple cake, this cake is quite easy one to bake at home with quick procedure. Gozleme is a popular Turkish stuffed flatbread and its quite a comforting food whoever loves stuffed flatbreads. 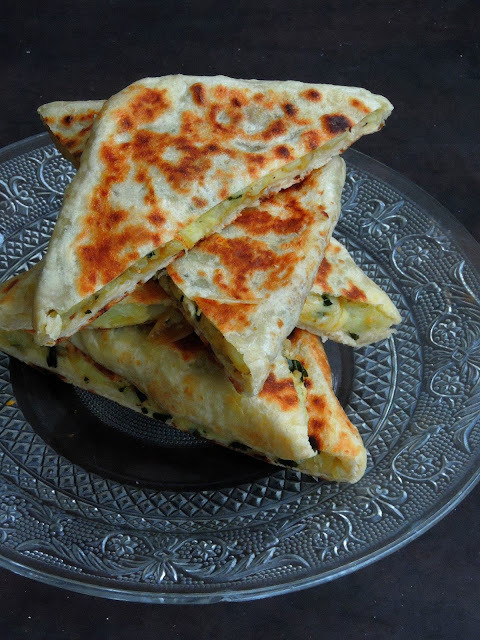 My today's post is potato and cheese loaded flatbread which is quite a filling meal for anyone. Gozleme comes from the Turkish world 'GOZ'' which is refers to the Little eyes or brown circles that form on the dough while its gets cooked. Am postng Turkish potato and cheese gozleme for this week's blogging marathon as am running with Stuffed flatbread from different countries. 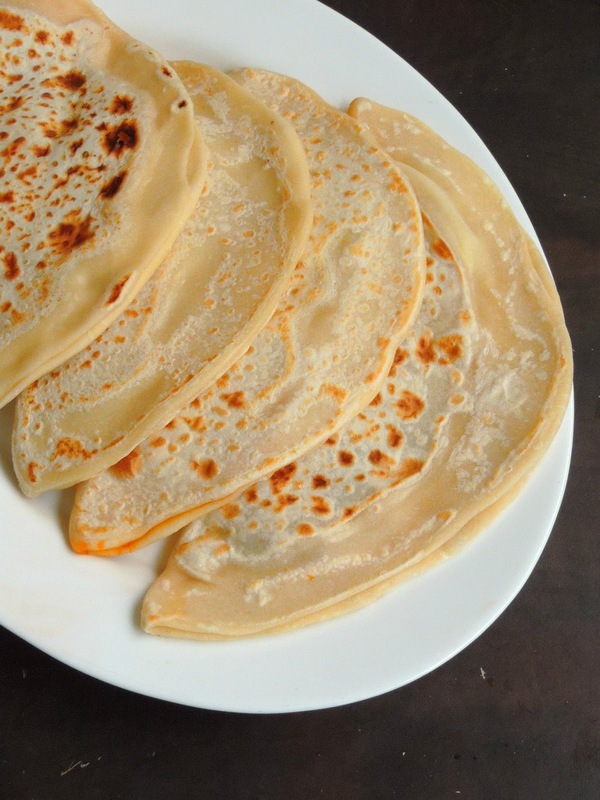 My kids love potato and cheese in anything,and this Gozleme is our recent favourite. Quite a filling one and definitely a comforting food if you are craving for something cheesy for your brunch,lunch or dinner. If you want to give a twist to your usual aloo paratha aka Potato masala stuffed rotis, am sure my today's post will definitely tickle your tastebuds. Masu Aluvi Roshi, this incredible stuffed flatbread is from Maldives. This fantastic flatbread is stuffed with a mild spicy and very delicious stuffing. Yes a spiced, cooked tuna fish and potato masala once stuffed with an all purpose flour dough makes this ultimate flatbread. 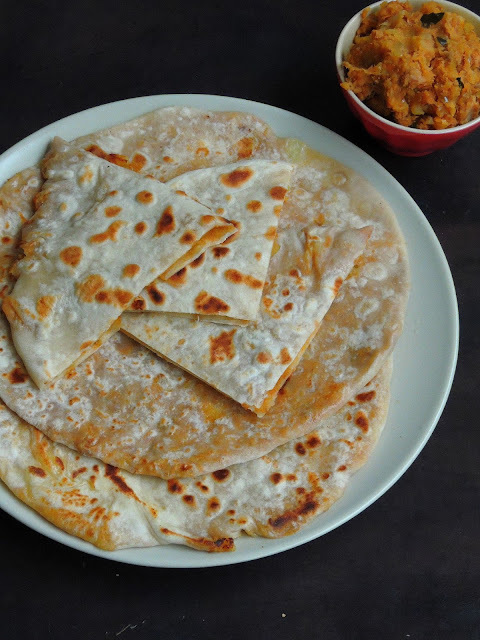 As much as like our Indian stuffed flatbreads, this Maldivian flat bread can be enjoyed without any side dish. You can roll this flatbread round or as squares depending upon how you want to shape your Mas Aluvi Roshi. This week's posts are going to be some delicious stuffed flatbreads from different part of the world. Yes this week's theme for blogging marathon is going to be Stuffed flatbreads from different countries. When its comes to stuffed flatbread, the only dishes comes to our mind is obviously Indian style of stuffed flatbreads like Stuffed Naan, stuffed rotis etc. But varieties of stuffed flatbreads from other Countries do exists eventhough they are quite unknown to us. However again Google master helped me a lot to find out three different stuffed flatbreads. My today's post for this week's theme is from Azerbaijan, Qutab is an Azerbainjanian stuffed flatbread. Easy to make this flatbread can be stuffed with different fillings. 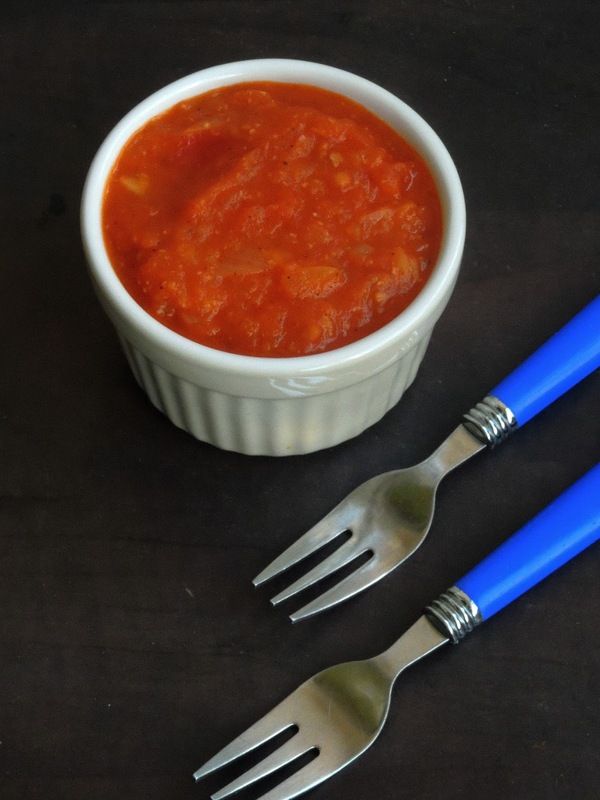 Sugo al pomodoro, is a simple, easy and delicious classic Italian sauce which is prepared with simple ingredients. 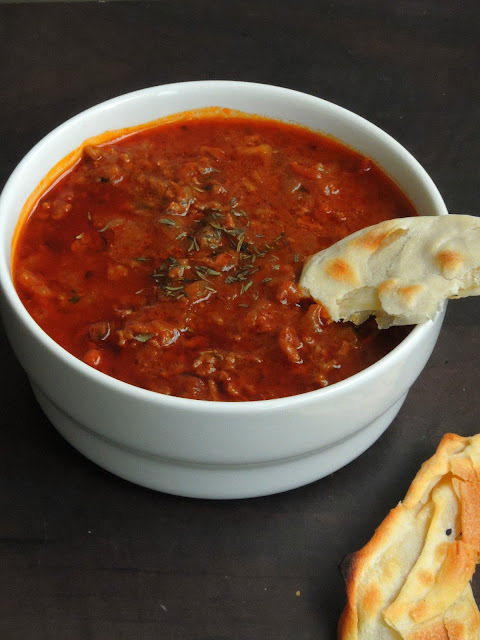 This sauce is prepared with onions, tomatoes with basil leaves, and this combination makes an excellent sauce to enjoy with pastas or else for layering your lasagna and why not to top a pizza crust. Yes this sauce is quite versatile and can be freezed very much for further use. Dont know why, this time i couldnt stop myself to post three classic tomato based Italian sauces for this week's blogging marathon. However anything cooked with tomatoes is our family favourite especially Italian sauces. Needless to say i have some ardent fans of pasta dishes at home, obviously all three sauces i have posted for this week's blogging marathon was a super duper hit among my family members. Italian sauces are quite interesting to prepare ourselves at home. Actually i started learning Italian sauce through few of my friends, however you can still learn many more sauces from the virtual world of blogging. I love to make my own dose of Authentic Italian dishes at home as i can find easily all ingredients from a nearby Italian store. Most of the Italian sauces are cooked with tomatoes, though my family members are ardent fan of Bolognaise sauce, i have been looking for a chance to cook an another meaty sauce from traditional Italian cuisine. As much as like always, i searched for an interesting and different meat based Italian sauce and i crossed this interesting Ragù di carne. Sugo alla puttanesca is one of the traditional sauce recipe which is quite an easy, delicious recipe to put all together. Puttanesca sauce recipe may varies depending upon the regions, Neapolitan version of puttanesca is prepared without anchovies. Sugo alla puttanesca aka Puttanesca sauce is a little salty sauce with wonderful flavor. 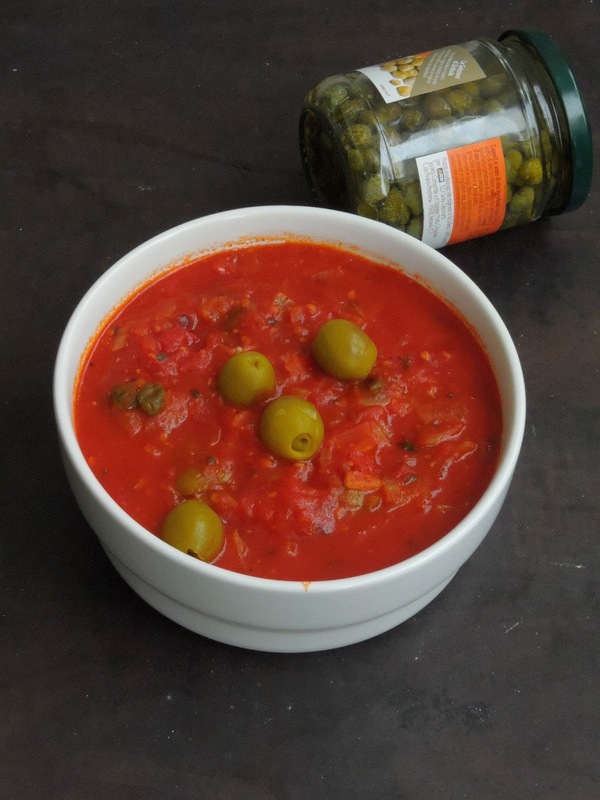 This sauce is prepared with capers, olives and anchovies with garlic. Traditionally this sauce is served along with Spaghetti, yes Spaghetti alla puttanesca is one of the famous pasta dish though this sauce is also paired with penne, linguine and vermicelli.